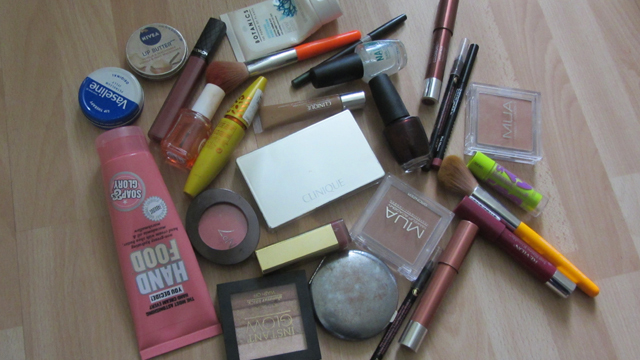 My bag got really heavy this week and the reason is down to all of these! Seventeen Instant Glow Bronzer Shimmer Brick in Gold Bronze – you never know when you need a bit of glow! MUA bronzers in shades 1 and 3 – I’ll post soon about these two £1 gems! Soap & Glory Smoulder Kohl in Superblack and Cocoa Bean – I always have a dark eyeliner with me to replenish during the day and turn up the drama at night! Revlon Colorburst Lacquer Balms in Ingénue and Coy as I always carry them together but this week I think I stuck to Coy, the darker one. Clinique All About Eyes Concealer in Deep Honey 08 – I can’t live without this one! That’s a lot, and I have no explanation for it! Body Shop compact mirror – battered and well loved. It’s sleek enough to fit into any handbag and it has a normal and magnifying mirror inside. I love it!